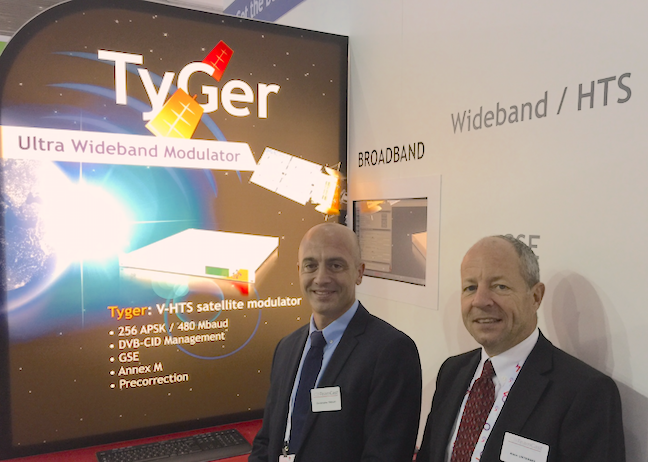 TeamCast's (left) Christophe Trolet, Head of Business Unit Solutions, and (right) Alain Untersee, Collaborative Projects Manager photographed with their TyGer V-HTS modulator. Team Satnews is in full force at IBC... blisters and band aids are proof of the magnitude of this show. A stop along the way found the publisher, Silvano Payne, and Director of Marketing, Jill Durfee at the TeamCast booth. Here they chatted with Christophe Trolet, Head of Business Unit Solutions, and Alain Untersee, Collaborative Projects Manager. TeamCast, provider of digital modulation technologies for Digital Terrestrial Television (DTT), Wireless Transmission and Satellite Applications, is demonstrating digital pre-correction, a major feature for increasing the usable payload of a satellite transponder at IBC 2016. Digital pre-correction of the satellite’s signal chain is a major technical challenge. Although first generation solutions have been available on the market for a few years the end results are not as great as expected, especially for the low order constellations which are the most widely used: QPSK and 8PSK. VYPER's range of satellite modulators and new and innovative digital pre-correction solutions were developed as the result of 20 years of experience. This new technique of pre-correction for satellite applications offers significant gains in budget margin, from 1.5 dB for 8PSK to 5 dB for 32APSK, and is available as a simple software upgrade for the VYPER modulators. Designed as a ready-to-use 1RU rack modulator/exciter to be integrated inside new and existing TV transmitters systems, TWISTER offers several key features to ease the integration within the transmitter design and to achieve top class of RF performances. This includes a state-of-the-art Digital Adaptive Pre-correction mechanism (GAP®), an Automatic Gain Control (AGC) process to ensure the correct output power stability and a monitoring of key transmitting power figures such as Forward Transmitted Power and Reflected Power levels. Originally designed for DVB-T and DVB-T2 markets, the product now supports ISDB-T/TB and DTMB standards. This addresses the needs for broadcasters in South-America, Philippines, China and Cambodia to upgrade and renew their existing transmitters. This also provides the opportunity for TX manufacturers who have already integrated TWISTER within their designs to enlarge their business footprint. DVB-CID is a standardized key feature that assists satellite users and operators to quickly solve satellite interference problems. TeamCast has designed a complete solution (transmission and reception) that deals with this latest feature also called Carrier_Id. Satellite users can manage and prove that they are compliant with this new feature that is becoming mandatory by regulation. TeamCast demonstrates first how its VYPER satellite modulator is adding the CID carrier to the transmitted carrier so that the resulting signal can be easily tracked and identified with proper receiving equipment. The demonstration also includes the use of TeamCast’s brand new CID receiver, which decodes the CID signal and allows operators to check and analyze carriers to ensure the DVB-CID signal is present and compliant with regulations. TWISTER designed as an innovative solution for the TV exciter market, comes as a ready-to-use 1RU rack exciter specifically designed to be integrated inside new or existing TV transmitter systems. TWISTER brings several key features to ease the integration within the transmitter design and to achieve the topmost RF performances. 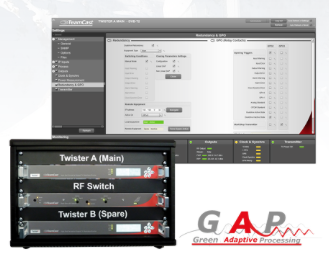 Among these specific features embedded into TWISTER is the Automatic Gain Control (AGC). TWISTER’s AGC is used today in a wide variety of situations, having been integrated by several TX manufacturers within their designs, and with many different operational technologies (A/B Class and Doherty amplifiers, various power ranges, analogue TV, digital TV, etc.). One of the most successful, but challenging achievements, has been to adapt and to optimize the TWISTER’s AGC for a high-power inductive output tube (IOT) DVB-T2 transmitter (10 kW RMS) in the ARQIVA broadcast network in the UK. This IOT TX consists of two PA stages (the intermediate power amplifier (IPA) acting as a pre-amplifier, before the main IOT amplifying tube), both of which behave differently, especially during the warm-up sequence. 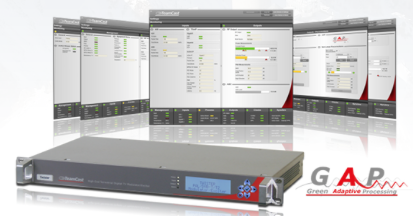 TeamCast demonstrated its unique and flexible ATSC 3.0 Single Frequency Network solution, using its Stream4CAST Scheduler/Gateway and its exTra3.0 exciters. Stream4CAST is a unique solution especially designed to implement Single Frequency Network architecture for ATSC 3.0. As a member of the ATSC forum and historic member of DVB, TeamCast's experience in the integration of latest generation of terrestrial transmission technologies was apparent in the development of a new product range dedicated to ATSC 3.0. Used in combination with exTra3.0, TeamCast ATSC 3.0 real-time DTV exciter, the Stream4CAST authorizes broadcasters to synchronize the RF signals radiated from several transmitting sites. Normally located at the head-end or at the Network Operating Center (NOC) the Stream4CAST product is responsible for the generation of the Studio-To-Transmitter (STL) data stream to feed the different transmitter sites. Eric Pinson, Business Unit and Sales Manager at TeamCast says, “With this unique turn-key solution, we are now in position to meet early broadcaster’s expressed demand for experimenting with ATSC3.0 transmissions in the field, including SFN networks. We introduced this solution last spring on the market and we have evolved it to support a preliminary version of the SFN-STL standard, which is currently under definition at ATSC. We are very proud to demonstrate this unique solution at IBC." Stream4CAST comes as a 1-RU rack stream processor unit that supports ATSC 3.0 modulation waveform. Fully controlled via a friendly WEB GUI, Stream4CAST features a very accurate stream Time Stamping mechanism, required to remotely time-align the ATSC 3.0 RF signals. Both input and output interfaces are fully IP based.